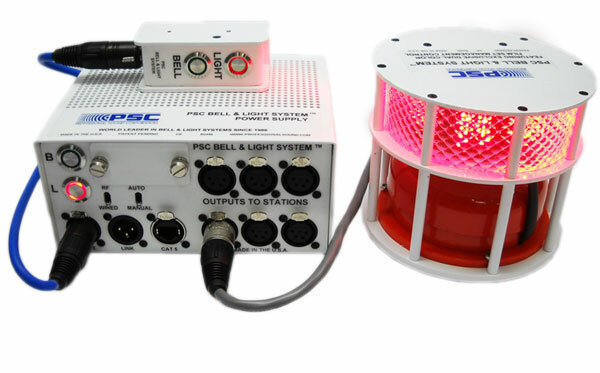 PSC has been designing and producing portable Bell and Light Systems for over 30 years. During these 30+ years, we have designed and engineered several generations of Bell and Light System designs. Each new generation improves upon the previous design. Our latest (4th generation) Bell and Light System is by far the best system on the market. 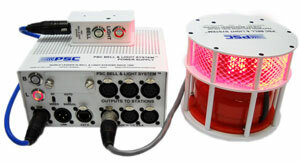 It offers new features never before found in Bell and Light Systems and takes the overall product to a whole new level. Dual Color Mode for Easy Set Traffic Coordination. It works like a traffic light, red means Stop, Green means Go. Omni View, 360 Degree Visibility. Our Competitor’s station only offers marginal 180 degree viewing, our station can be viewed a full 360 degrees. Most Compact Stations in the Industry. This means you can pack, store and ship more stations in one Pelican case than any other brand. Super Rugged Housing Design. Our Station design includes a full, built in “roll cage” for industrial strength “field tested” ruggedness in a compact package. Our robust station design will in fact support several thousand pounds! 3-Way Flash Speed, from a soothing slow speed to an attention demanding fast flash rate, the choice is yours. Each station offers an individually selectable flash rate. 3 Different Mounting Thread Standard. Our Bell and Light Stations come standard with three different mounting threads. These include ¼”-20, 3/8”-16 and 5/8”-27 which is compatible with common microphone stands. Switchable Bell, this feature was originally offered on our 3rd generation systems and is a PSC original feature. Link Connector, this is another feature originally brought to you by PSC and featured in our previous generation systems. It is used to allow easy and convenient, “Daisy Chain” wiring of the Bell and Light Stations. Dual Color Mode for Easy Set Traffic Coordination. This feature originates in our Power Supply and requires the use of our new Dual Color Stations. Most Compact Power Supply in the Industry. Our Power Supply is a full 20% smaller than any of our competitors. Operates up to 80 Stations. Yes, even though it is the most compact power supply in the industry, our power supply will operate up to 80 of our stations. That is a nearly 3x more stations than any competitor. Four Way Operation. Wired Manual, Wired Fully Automatic, Wireless Automatic, Recorder Driven Wired Fully Automatic. These features alone make PSC the obvious choice. Fully Automatic Mode: Self Generates Bell Start and Stop Pulses. Upon activation at the start of a take on a film set (automatic modes) the power supply generates one long blast of the bell while simultaneously starting the lights. At the end of the take, when the direct yells “cut” the power supply turns the lights from Red to Green and then give two short blasts of the bell. These timing functions are controlled and generated automatically. This fully automatic mode is available when driven directly from specific recorders or via our option wireless remote control. Link Connector, this is another feature originally brought to you by PSC and featured in our previous generation systems. It is used to allow easy and convenient, “Daisy Chain” wiring of additional Power Supplies for use in very large systems. Smallest Controller. Yes, our remote control is the smallest, most rugged unit on the market. Belt Clip Provided. The Stainless Steel Belt Clip can be mounted in one of three convenient positions. Stainless Steel Flush Push Button Switches. 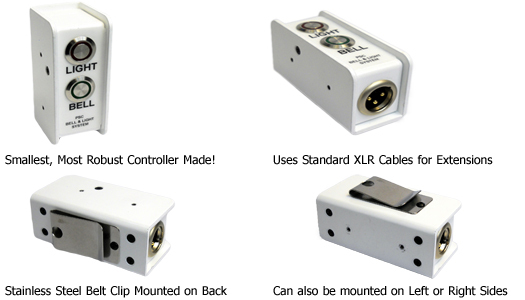 We researched, tested and use only the best, Made in the USA Flush Mount Switches. Standard XLR Microphone Cables for Extensions. PSC originated this standard for wired remote controls. Need a longer remote control cable, simply plug in another XLR microphone cable.